*THIS card, instructions,card design & post was done by the Editor of the Creative Esacpe Papercrafting blog, also on WordPress: Ms. Bev Code. * She is very gifted & creative, as you can see! Bev, it’s so thoughtful of you to share instructions, pictures and tips & tricks with all of us! This will be fun for fussy cutters OR you could use a stamp & heat emboss little messages & images. (Remember all of those tiny words on stamps and stickers that have been so popular?) A lot of possibilities – my mind is racing now! Bev is also on other teams & does a lot of scrapbooking! This, is truly what Creative Escape Papercrafting is about: learning, sharing & hopefully making everyone inspired. 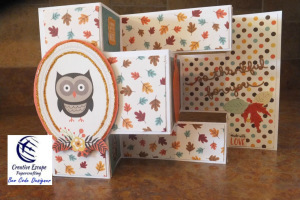 This kit is packed with hand-picked goodies to enable you to have a fall card making frenzy. It’s perfect for Thanksgiving cards but also has elements that you can use all year. A few stand-alone products OR extra products to create Christmas or Hanukkah card creations – or refresh your stash for handmade cards made easy… Creative Escape Papercrafting.com DOES combine shipping, offers subscription benefits with three different price points. Check out: Bev Code, Mrs. Davis Crafts & Kenchi School for inspiration & ideas for creating cards. Sending a card to let someone know you care could never be ordinary with this cute set by lawn fawn! Add in a fun Oktoberfest scene to brighten someone’s day even more with this handmade creation! I used items from the “Fall Frenzy” kit from creativeescapepapercrafting.com to create this card. Of course, there will be more Fall, Halloween & birthday cards to come very soon from me using this great kit!